2 Bedroom Flat For Sale in Plymouth for £125,000. A Spacious modern TWO BEDROOM APARTMENT ideal for growing families, First Time Buyers or professional couples. The open plan style of the lounge/kitchen/diner creates a wonderful space for socialising and entertaining, with the balcony offering additional space during the warmer summer months. 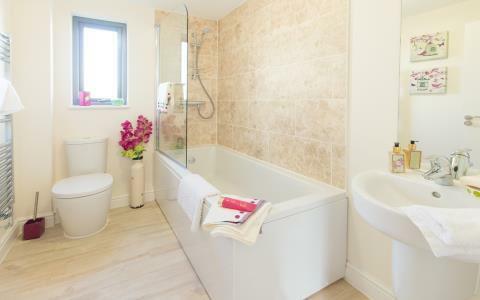 Both bedrooms come with optional fitted wardrobes and the master bedroom has the benefit of an en-suite shower room. Exceptional design and clever storage areas make this apartment a must see for buyers and investors alike. Vision is a brand new development featuring more than 450 new homes, shops, offices and community facilities. This exciting mixed-use neighbourhood boasts a stylish collection of 1, 2, 3 and 4 bedroom homes, built to the highest standard. With specific attention to achieving high eco standards, this superb range of homes isn't just more cost effective to run, it will also have a less negative impact on the environment. Set is a suburb of the marvellous maritime city of Plymouth, to the far south west of Devon, Devonport boasts a truly enviable position.